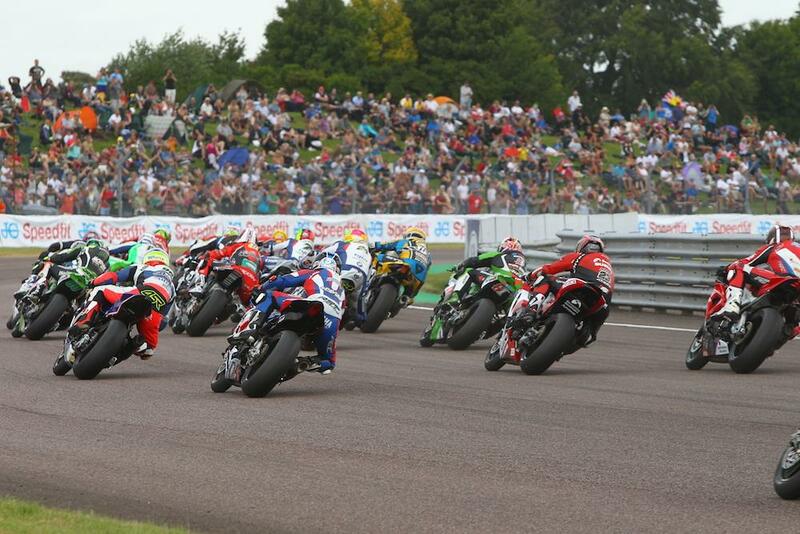 Shane Byrne took an emphatic victory in a two-part opening MCE British Superbike race at Thruxton to extend his series lead to 26 points. Having dominated the entire weekend, Byrne shot off the line on the Ducati Panigale and looked set to take a lights-to-flag victory until the a red flag halted action at the halfway point following a blow-up for ePayMe Yamaha’s Stuart Easton. Michael Laverty took a charge to second before the red flag, ahead of Dan Linfoot, Tommy Bridewell and Billy McConnell with youngster Lee Jackson in the mix. New championship rules dicate riders must re-start an interrupted race on the same tyre they’d used in the first part, making tyre conservation more important than ever. Sensing a chance for victory, Laverty charged off the line with his softer rear tyre in relatively good shape but he wasn’t able to hold off Byrne for long, the Ducati man shooting through at the end of lap two before breaking clear. While the soft tyre worked for the leading duo, it caused chaos behind as early third placed man Jason O’Halloran started to slip back into the grasps of the chasing pack, with Luke Mossey and Tommy Bridewell benefitting most on the harder tyre as they moved into third and fourth respectively. James Ellison turned his weekend round to take a strong fifth place ahead of Honda’s Jason O’Halloran while the Bennetts Suzuki of Ryuichi Kiyonari finished seventh ahead of Richard Cooper. Jakub Smrz and Tommy Bridewell rounded out the top ten. Leon Haslam’s tough weekend continued as his tyre dropped off to the end of the race leaving him to fall back to 13th from as high as fifth, but it was even worse for Dan Linfoot who struggled with the harder tyre in the second half of the race and retired from 27th place. BSB: Byrne: "I didn't expect to be champion"